548a.m. 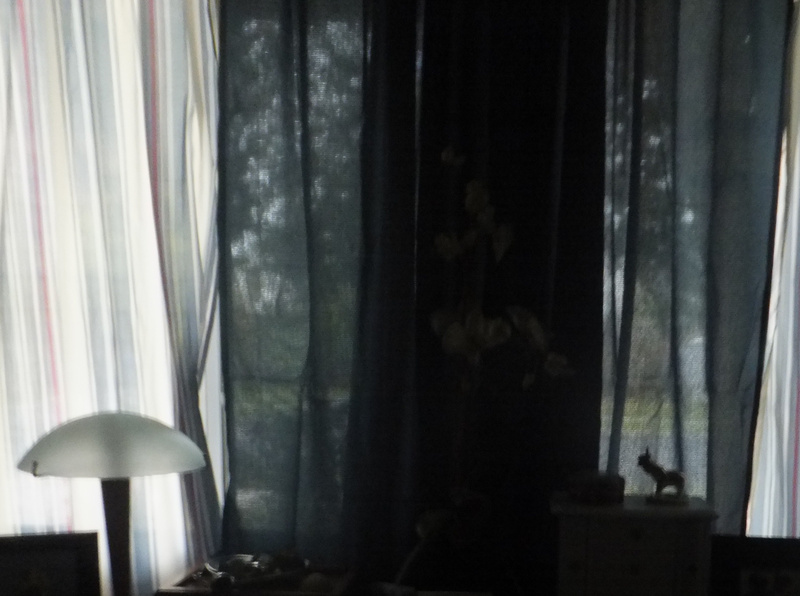 Pretty dark through the curtains. No birdsong. The bed is mine, S walking the dog, the boy snoozing anywhere from the next 15 minutes to the next hour. Barely awake, I feel the effects from gazing at my work until 1a.m: the world’s largest cat (it is boulder-stout and woolly) sits on my head. The real cat, 1 of 3 lounging around here, sighs audibly at my feet (almost every breath that leaves him has a sound tucked in it). He noses my right foot. The comforter is thick, but I feel his teeth anyway as he holds my big toe in his mouth, hoping the pressure will get me up and filling his bowl with wet stuffs. I dreamt about an ex-boyfriend–a duplicitious stockbroker (is there any other kind) who lied to himself, then me. All month I’ve been having ex-boyfriend dreams (certain disastrous choices, walking and talking). Maddening. Let go, I urge myself when meditating, of the past. But I thought I had–but there he was, a ghost harrassing. Over the weekend a friend’s friend suggested I go f*** myself. A stranger’s response to my comment that he not berate my friend over objections to Rush Limbaugh’s (I feel dirty writing that name) attack on Sandra Fluke. If you don’t like what he says, don’t listen to his show! My friend’s friend wrote. I responded: You don’t have to listen to RL’s show to know what he said. Obviously his comments are on every major newsfeed, network. Probably because I used obviously. Then I really felt dirty. Disturbed. And so foolish for engaging. I deleted my comment. We are usually off the grid in this house. It tends to make for clear(er) thinking and fosters creativity (unless it’s 1 or 6a.m.). We don’t have cable. My son is confused by commercials the rare occasions when he sees them at a relative’s house. He doesn’t understand why we can’t pause TV shows so he can run to the potty. When I present him with a new book, he gasps with delight and immediately sits down to ‘read’ it. Here, we watch DVD’s, not networks, and listen to a blatantly eclectic mix of music when we play in my son’s room. I don’t check in on Yahoo News. I avoid people.com. I only look at CNN if there’s an earthquake, tornado near Des Moines, or a country afflicted with a natural disaster. I never click on links written in caps and punctuation marks telling me I must know why those freaky three sisters are dabbing tears from their fake eyelashes. Writers live here–with hulu, sometimes, but writers–and a precious forming mind–live here, mostly off the grid. What can you do to promote world peace? Go home and love your family. Mother Teresa. All weekend I focused on loving my family and sweeping my own doorstep, not others’, which is impossible anyway. “No!” I whisper to the cat and he jumps off the bed with a noise and stalks from the room complaining. “Mama! I’m awake!” Outside, the jingle of the dog’s collar. An unmistakable clunk as the front door opens. “Helloooo, family,” S says softly. Thank you, thank you, thank you. This entry was posted in books, dog, Me and Us, Quotes, Writing and tagged 2012, cats, chaos, domestic bliss, Facebook, fiction writing, Mother Teresa, preschoolers, quotes on writing, Sandra Fluke. Bookmark the permalink. Ex-boyfriend dreams are the worst! It’s like, I’m sure I’ve let go, and then this dream pops up out of nowhere. So irritating. As are people who take political commentators so seriously that they’re willing to alienate a friend’s friend over it.